APR 1956 - OCT 1956 amphibious exercises med. Plymouth Rock (LSD-29) was laid down by Ingalls Shipbuilding Corp. Pascagoula Miss. 4 May 1953 launched 7 May 1954; Sponsored by Mrs. Francis C. Denebrink; and commissioned 29 November 1954 Comdr. D. Bontecou in command. After sailing in January 1955 to Norfolk her homeport Plymouth Rock conducted shakedown off the East Coast and in the Caribbean. In the summer of 1955 she transported men and equipment to early warning sites in the far north. In March 1956 she deployed to the Mediterranean for amphibious operations returning in October. During 1957 she made numerous trips to the Caribbean and again resupplied the Arctic Distant Early Warning Line. >From May to October 1958 Plymouth Rock operated as a unit of the 6th Fleet in the Mediterranean participating in the landing of U.S. Marines in Lebanon in July. After developing the concept of "vertical envelopment" by helicopter assault in early 1959 she made a Caribbean cruise to Puerto Rico and Cuba. In February 1960 she participated in operation "Amigo " carrying support helicopters and other equipment for President Eisenhower's visit to South America. From March to December she again deployed to the Mediterranean. During 1961 Plymouth Rock made several cruises to the Caribbean and one to the Mediterranean including work on project "Mercury" and project ASROC. During 1962 she made several deployments to the Caribbean and was a member of the blockade force during the Cuban Missile Crisis. On 7 May 1963 she again deployed to the Mediterranean returning in October. 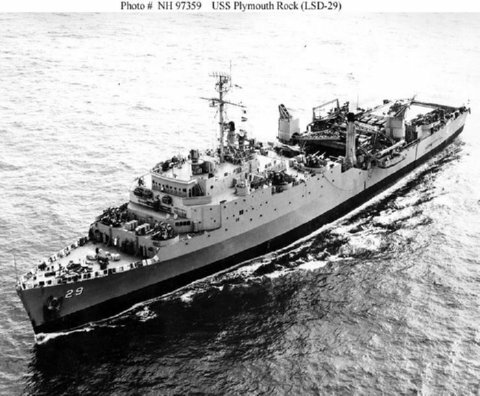 In 1964 Plymouth Rock made two Caribbean cruises and then took part in operation "Steel Pike I" off the coast of Spain the largest amphibious operation since World War II. Early 1965 found Plymouth Rock on another Caribbean cruise. From 28 January 1966 to 7 March she was involved in H-Bomb recovery operations off Palomares Spain. Late 1966 found her once again in the Caribbean providing for the victims of hurricane "Inez" in Haiti. After three Caribbean cruises in early 1967 Plymouth Rock deployed to northern Europe. She made two more Caribbean deployments in 1968. From June to July 1969 she again deployed to northern Europe. She remains with the Atlantic Fleet into 1970. Plymouth Rock was decommissioned 30 September 1983 and transferred to the Maritime Administration 8 Nov. 1989. Her name was struck from the Navy List on 24 February 1992 and she was sold 25 August 1995.